The government will be taking decisions on the housing sector in the near future. The 1,300 social housing units under construction will only be given to those genuinely in need, the Prime Minister said on Sunday adding it would not be distributing them 'like a Father Christmas'. “We have to be clear on this matter, even at the cost of losing votes,” he remarked. 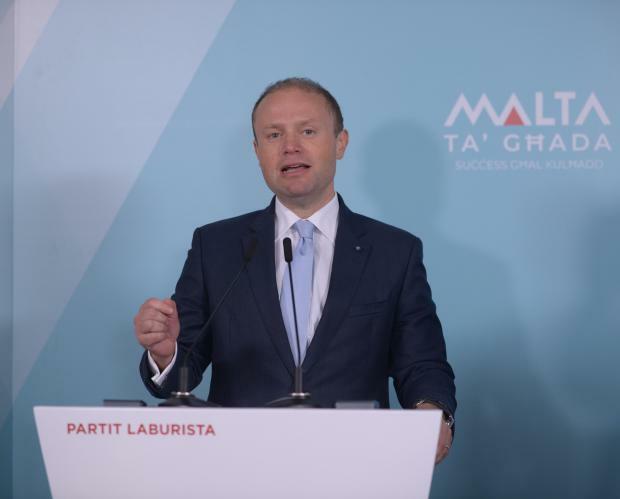 Joseph Muscat was addressing a political activity at Mġarr during which he spoke at length on government’s plans to address the housing problem. He remarked that for many years a “free entitlement” mentality prevailed whereby successive governments would distribute flats to applicants, which the latter would keep for life, if not from one generation to the next. Dr Muscat said the government wanted to inculcate a new mentality whereby only those who could not afford to buy or rent a house would be offered social housing. However, the solution was not to construct more housing estates as used to happen in the past, he said..
“People with problematic backgrounds cannot be grouped together as this would result in a ghetto. The time of housing estates is over,” he said. “Had we opted for such model we could have constructed more with less, but we did not want to create problems which would have to be faced in 20 years’ time,” Dr Muscat added. That why the 500 dwellings being financed from the passport scheme were being constructed in 22 localities, so as not to group them together, the Prime Minister said. He pointed that from now on, tenants moving in the new social housing apartments would be monitored including by social workers who would provide support for them improve their quality of life. The ultimate objective would be for them to eventually have the necessary means to move out and make way for those in need. “Handing over the keys of an apartment will be just the start of a process,” he said. The Prime Minister insisted that whoever would be given social housing would not enjoy perpetual lease as used to happen in the past. "This is why these apartments will be rented out and not sold," he added. “The current situation of free entitlement for social housing has to stop,” Dr Muscat said. However, he pointed out that for such measure to be successful, future governments had to follow suit. The Prime Minister said the government would be taking decisions in the near future on the way forward in the housing sector. “I cannot convey a message that the government will use these 1,300 homes and give them away like tokens as used to happen in the past. The government could not dish out flats as if it was Father Christmas,” he said. Such an approach would be completely unfair for those hard-working couples who had to toil to buy their property, he added. “Social housing was there for those who really need it. One could not expect to save money at the taxpayers’ expense by abusing the scheme,” Dr Muscat noted. In his address, the Prime Minster also referred to the forthcoming European and council elections, saying the party had to keep its feet on the ground. Rubbishing predictions that Labour could even win five of the six seats up for grabs, he said that a repeat of the 2017 general election – Labour’s largest ever margin of victory since Independence – would still yield three seats to the PL due to the electoral mechanism in place.